According to al.com, this 25-year-old victim was threatened with robbery in her apartment at gunpoint, and when she said that she had no money to give, she was captured and trapped in the robber's car - then, eventually, in the trunk of the vehicle. 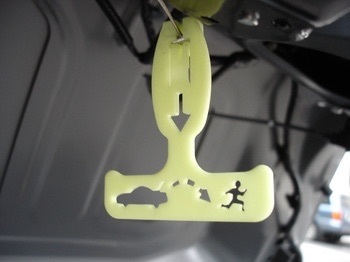 In case anyone doesn't know, all cars made after 2002 are required to have emergency release levers in the trunk. They're glow in the dark, and they look like this. If you're ever stuck in the trunk of a car, that handle can get you out. Store this woman's move away in your "good to know, but hope I never need it" file.